Small toy spaniels have been known in Europe and Great Britain since the 16th century and were popular subjects of the most famous painters from the 16th, 17th and 18th centuries. The Cavalier King Charles Spaniel is descended from these toy spaniels. Early toy spaniels were quite common as ladies’ pets, and during the reign of King Charles II, they were given the royal title King Charles Spaniel. 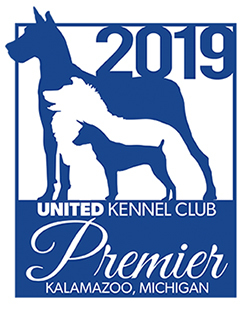 When serious show dog breeding began in England, the dog's face structure changed to have the look of the Pug until an American, Roswell Eldridge, offered a cash prize at the Crufts Dog Show for a dog that resembled those in the early paintings. With careful breeding, the shorter-faced dogs became the English Toy Spaniel, and those that more closely resembled the originals became known as the Cavalier. The Cavalier King Charles Spaniel was recognized by the United Kennel Club in 1980. The Cavalier is an active, graceful, elegant toy spaniel, with a gentle expression. It stands 12 to 13 inches in height and weighs from 12 to 18 pounds. It has a long, silky coat that comes in four color variations, and is characteristically untrimmed. Absolute soundness and proper muscle tone is a must. Head properties should remain free of exaggeration so as to not obstruct normal vision. Very gay, fearless and sporting, yet gentle and affectionate, with no tendency toward nervousness. Appears flat across the top due to the high placement of the ears. Stop is shallow. Slightly rounded, but without any dome or prominence of occiput. Approximately 1½ inches in length, tapering well towards the end, but without snipiness. The lips are well-covered, but not pendulous. Cushioning below the eyes contributes to the characteristic expression, which is sweet and gentle. Relatively large, dark and round, but not prominent. Set well apart. No haw showing. Nostrils should be well developed, open and black. Fully-pigmented. Set high, leather long with plenty of feathering. Moderate in length, without throatiness. Slightly arched at the crest. Set smoothly into nicely sloping shoulders. Shoulders should slope back with moderate angulation. Straight and well under the dog, with moderate bone. Elbows close to sides. Short-coupled, with ribs well-sprung, but not barreled. Chest moderately deep, leaving ample room for heart. Back level. Slightly less body at flank than last rib, but no tucked up appearance. Hind legs moderately muscled; well angulated at the stifles and hocks. Rear pasterns relatively short and at right angles to the ground when standing. Viewed from behind, rear legs should be parallel to each other from hock to heel, with no tendency to cow hocks, spread hocks or sickle hocks. Compact and well feathered, with well-cushioned pads. Set to be carried with the level of the back. Tail should be in constant motion when the dog is in action. Docking is optional. If docked then leave at least two-thirds and dock to leave a white tip. Long, silky, and free from curl, though a slight wave is permissible. There should be plenty of feathering. No trimming. -	Black and Tan. Raven black with tan markings above the eyes, on cheeks, inside ears, on chest and legs, and underside of tail. Tan should be bright. White markings are undesirable. -	Ruby. Whole colored rich red. White markings are undesirable. -	Blenheim. Rich chestnut markings well broken-up on a pearly white background. The red on the head must extend around the eyes as well as down over the ears. 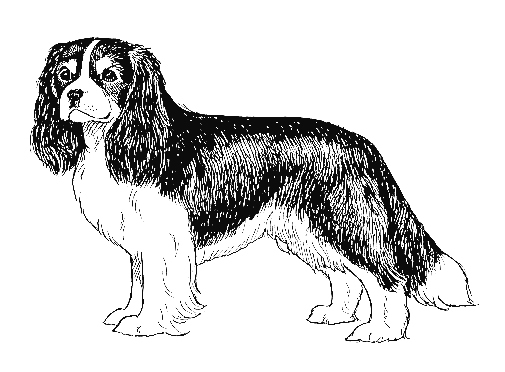 There should be a white blaze between the eyes and ears in the center of which is the lozenge or “Blenheim Spot” unique within the Blenheim Cavalier King Charles Spaniel, a highly desirable, but not essential characteristic of the Blenheim. -	Tri-color. Jet black markings well broken-up on a pearly white background with tan markings over the eyes, on cheeks, inside ears, inside legs, and on underside of tail. Any other color, or combination of colors, is highly undesirable. Height, measured at the withers, is 12 to 13 inches. Weight is in proportion to height, averaging from 12 to 18 pounds. Slight variations from the ideal are acceptable as long as the dog retains breed type.